A Sneak Peek Behind the Scenes of Board Meeting Preparation. Taking a train into London during the rush hour, I overheard a conversation about today’s board meeting at Megacorp, and more specifically, what kind of sandwiches each board director requires. Huge attention to detail, many different requirements. The giver of the information knew everything there was to know, she had clearly done this many times before, and duly passed it on, name by name, sandwich by sandwich. Without missing a beat. Joe: Cheese and Pickle. Debbie: Ham. Peter: Prawn….etc etc. One of the Directors is called Nick, and the chat about him really caught my attention. Apparently he doesn’t like lettuce, and if you get him a sandwich with lettuce in it, he really complains about it. Really complains. Poor Nick, I really feel for that guy. Fancy going to all the trouble of being paid to attend your own board meeting, only to find that someone might bring you lunch with *shudder* lettuce in it. Imagine that happening. Imagine the humility of having to pick the lettuce out in front of your fellow Directors, you’d lose all respect, wouldn’t you? No wonder he really complains. I get off the train at this point and leave all the high level stuff behind me. Whilst it was great to get a brief insight into the strategic planning behind a board meeting, I confess things were getting too exciting for a mere worker like me. Before my attention drifted to what sandwich I might want for my own lunch (note to self, I need to recruit a sandwich advisor), two thoughts flashed across my mind. The first was this: If the board’s sandwich requirements are so utterly predictable, what might that tell us about the rest of the meeting? Board meeting? More like bored meeting. And second, I can’t help but feel that the world might be a better place if once in a while, we told people like Nick to go and get the sandwiches. I first published a version of this post on Medium back in 2015. 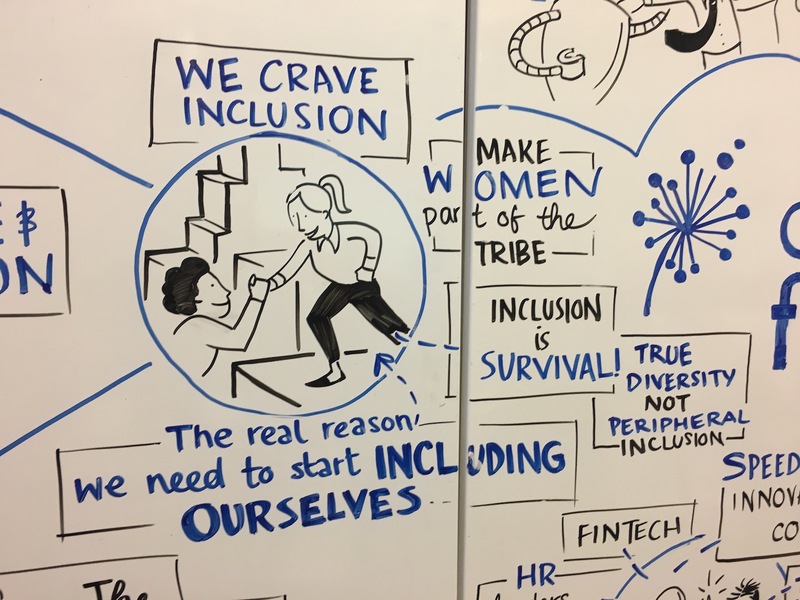 I was inspired to revisit it after reading this excellent piece titled Minutes, Meetings and Minutiae, by Gemma Dale, which challenges that persistent behaviour whereby women are so often expected to take the minutes, get the sandwiches, etc. Author Doug ShawPosted on July 5, 2018 July 5, 2018 Categories HRTags HR, meetings, minutes, sandwichesLeave a comment on What Really Matters? ChangeBoard Conference : Mental Health, Inclusion and Good Work. I’m spending the day at the ChangeBoard Future Talent event. The key themes for today are, the fourth industrial revolution (I confess I didn’t even know that was a thing), inclusion and mental health. A few points which have resonated with me so far. Sue Baker from Time to Change (TTC) talked about how mental health conversations are now much more commonplace at work. The Time to Change movement is big, and growing, currently 750 organisations are signed up. Sue spoke about how we need to think of mental and physical health as parts of the same whole, I like that. Here is a stark display of how far we’ve yet to go. Sue asked us, by way of a show of hands, how many people in the audience would discuss their mental health with extended family. Many many hands were raised. We were then asked would we discuss our mental health at a job interview. I didn’t see a single hand raised. Children assume inclusion – we seem to lose that during our school/teenage years. Why? In organisations we rarely discuss and contribute to change because we’re often only peripherally included. There’s a high risk our idea may go ‘wrong’ and we’ll get the blame for that, so we wait, stay silent or agree with others. Women apply for jobs when they believe they can meet 100% of the stated requirements, men will settle for 50%. How about we all aim for around 80%? Leave room for growth, and discourage men from over including themselves? When the door won’t open : there are three typical responses to routine exclusion. We self exclude – this is the easiest choice. We get angry. We get persuasive, try to charm our way in. Inclusion is about helping others feel better about themselves. 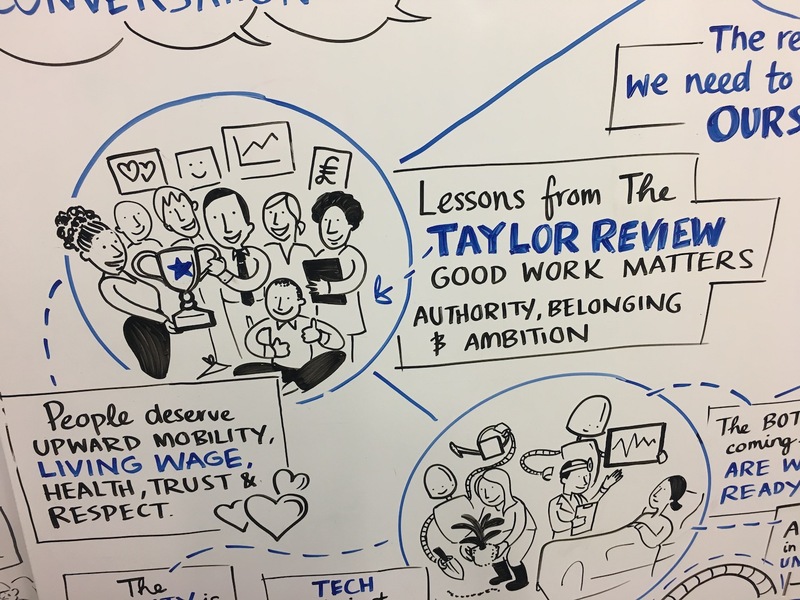 Matthew Taylor suggests key things which will make work better. Social contract, wellbeing, productivity (being held back in part by poor quality of management), active citizenship – and this cannot stop at the office/shop/warehouse/factory door. Tech – being positioned as an overwhelming force – get with it or get out of the way. We need to consider tech as an enabler of better things, stop positioning it as a threat. Self employment v employed. Rights (and taxes). Precarious self employed and privileged self employed – the older white man as a freelancer is a growing workforce. Chancellor is onto this and busy picking apart the tax benefits, this will further take the shine off self employment. Another reason offered for a plateauing of self employment is simply that we like to work in organisations. We are motivated by authority, belonging, and ambition, and organisations can provide those things. The tricky bit is aligning them – MT suggests this action should be the core business of an organisation. A good workplace is a ‘creative community with a cause’. Sadly – many people who leave organisations say ‘they’re simply sick of it’. Author Doug ShawPosted on March 22, 2018 March 24, 2018 Categories HRTags ChangeBoard, future talent, live bloggingLeave a comment on ChangeBoard Conference : Mental Health, Inclusion and Good Work. For the last four years, it’s been a pleasure and a privilege to work with excellent people, developing and delivering a range of creative fringe events at the annual CIPD conference. Up until a few weeks ago – we were getting ready to make it five years in a row. We had extensive internal conversations over the past couple of weeks and I am sorry to let you know that, because of all the changes that we are going th[r]ough, we are unable to secure the investment needed to organise and run the fringe events, ignite labs, or the reflect and connect sessions at this year’s ACE. It’s no secret that fringe events don’t always attract huge numbers, and it’s also no secret that the people who turn up and participate, often really appreciate and enjoy the opportunities they cocreate together. Decisions have to be made, and this one appears to be based on cost as opposed to value. Subsequently it transpires fringe events will continue at the conference this year, and my understanding is people won’t be paid to run them. That’s their choice. Lots of us choose to do voluntary and pro-bono work, me included. It’s good to give something back, particularly to organisations which do great work and are short of cash. I’m not sure that working for free at a commercial event which charges exhibitors thousands of pounds for floor space, and conference goers hundreds of pounds to attend, is in quite the same category. I’m citing a specific event here, however more broadly, I engage in lots of discussion about why commercial events expect people to work for free, or (shudder) for the ‘exposure’. I’m aware of someone who was recently asked to judge some awards, and was expected to pay for the ‘privilege’ of doing so. And don’t get me started on everyone who is expected to give up their time to speak at events for free. People want to give back, want to share knowledge, want to help those coming though or starting in their careers, but isn’t this knowledge and expertise worth something? It’s tricky, but when the idea that freelancers will work for free is set as the default, and we agree to play by those rules, ultimately we support the practice, and become part of it. All good things come to an end. I can’t deny I find the change in how the fringe at this event will now operate, disappointing, both in itself and in the manner in which it has arisen. However it has been excellent fun and great learning helping to shape and facilitate so many engaging and interesting gatherings over the years. HR Unscrambled, Reflect and Connect, The Art of Conversation, and Performance Related Play have been some of the best things I’ve been fortunate to take part in. Thank you to everyone who has conversed, drawn, painted, played, shared experiences, reflected, taken action, and got to know each other a little better.